Talking drums on Hugh Masekela's album "Beatin' Aroun De Bush" and "Homecoming Concert"
Guitar on the album "An Evening With Belafonte And Friends"
Producer of "Gomen Nasai", "Jerry", "Man Smart #1 & #2", "Scarlet Ribbons #1", "Shenandoah #1", "Springfield Mountain", "Suzanne #1"
Producer of "Close Your Eyes", "Deep As The River", "Farewell To Arms","How Green Was My Valley #1", "I Still Get A Thrill " "Sometimes I Feel Like A Motherless Child", "Whispering"
Bass. Worked with Belafonte 1954-1962. Appears on "The Blues is Man 1", "The Blues is Man 2", "Brown Skin Girl", "Cocoanut Woman", "Cordelia Brown", "Delia", "Dolly Dawn", "Don't Ever Love Me", "The Drummer And The Cook #1", "The Fox", "Fifteen", "Haiti Cherie", "I'm Going Away", "Island in the Sun", "Jamaica Farewell", "Judy Drownded", "Lead Man Holler", "The Lord is My Shepherd", "Love Love Alone", "Lucy's Door", "Mama Look A Bo Bo", "Melda Massi", "Scratch, Scratch", "Soldier, Soldier", LSP2388, LSP2449, LSP2574, LSO6006, with Miriam Makeba on KL1274 and Chad Mitchell Trio on KS-3313. Backing vocals on Miriam Makeba's "Eyes On Tomorrow". Composer of "How Green Was My Valley"
Composer of "Smoke Gets In Your Eyes", "They Didn't Believe Me"
Vocals on Harry Belafonte's album "Paradise In Gazankulu"
Backing vocals on Miriam Makeba's album "Eyes On Tomorrow". Drums, vocals on Harry Belafonte's album "Paradise In Gazankulu". Composer of: "Move It"
MELT2000 BW093 "Follow Your Dreams"
Violin on Harry Belafonte's recordings of "Eden Was Just Like This", "When The Saints Go Marching In"
Need no further presentation. The album BEL-1 was a beneficiary performance for Martin Luther King's Civil Rights Movement on which a number of Swedish artists participated together with Harry Belafonte on March 31, 1966. Part of the vocals group that followed Belafonte along the tours around 1960. Piano on Harry Belafonte's recordings of "Hava Nageela #2", "When The Saints Go Marching In"
Composer of: "Monday To Monday"
Saxophone on Harry Belafonte's recordings of "Baby Darlin'", "Hello Everybody", "Man Smart #3", "Matilda #2", "Scarlet Ribbons #2", "Troubles", "Waterboy"
Contractor on Harry Belafonte's recordings of "Baby Darlin'", "Hello Everybody", "Man Smart #3", "Matilda #2", "Scarlet Ribbons #2", "Troubles", "Waterboy"
Acoustic Guitar on Miriam Makeba's album "Reflections"
Drums on Harry Belafonte's recordings of "Baby Darlin'", "Hello Everybody", "Man Smart #3", "Matilda #2", "Scarlet Ribbons #2", "Troubles", "Waterboy"
Member of The Chad Mitchell Trio together with Chad Mitchell and Joe Frazier.. Member of the Johnny Mann Singers of today. Vocals. Appears on Harry Belafonte's album Turn the World Around"
Trombone on Harry Belafonte's recordings of "Hello Everybody", "Man Smart #3", "Scarlet Ribbons #2", "Troubles", "Waterboy"
Accordion on Harry Belafonte's European 2003 tour. Bass guitar on "Paradise In Gazankulu" and on the video Graceland in Zimbabwe. 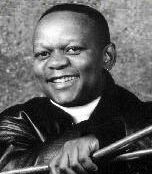 With Hugh Masekela on "Beatin' Aroun De Bush" and "Homecoming Concert". Info about the band Ojoyo here. With Miriam Makeba on the album "Eyes On Tomorrow". Drums on the 1988 European Tour. and on "Global Carnival". More info here on Sipho's website. Guitar, koto and bouzouki on R4P5054. Appears on "Turn the World Around"